Landscape Construction | Lafayette Tree & Landscape Inc.
Garden construction begins with functional elements such as proper grading, irrigation, drainage, and erosion control systems. Next, with the development of patios, decks, fences, pools, fountains or retaining walls, the garden starts to take shape. The magic continues with artistic selection of plant material and the final showcasing of your garden is achieved through subtle placement of lighting and sound systems, giving your garden a natural “wow” factor. From concept to creation, we work closely with each of our clients to develop a customized plan that maximizes the use of your outdoor space. The scope of our talents is varied. We can create an outdoor space ranging from a lively entertainment center, complete with surround-sound and state-of-the-art kitchen, to a quiet, reflective meditation garden with a softly trickling stream. A garden developed with drought-tolerant native plants, attracting birds and butterflies is a welcome addition to a home. Discouraging pesky wildlife who can wreak havoc in a garden is sometimes a necessary task. Front entry areas have special needs, such as improving the value of the property or dealing with safety issues. 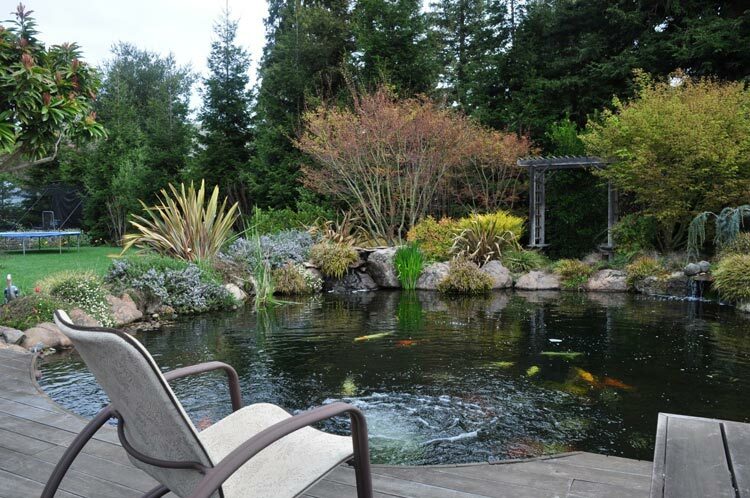 Our objective is to bring our talents to the table, to help create your ideal garden. The environment and footprint we leave is a priority for us and part of our tradition. We continually strive to learn about implementing cutting-edge, eco-friendly building practices. Some of our strategies have included: use of sustainable products, develop water and energy saving strategies, re-use and recycling of existing materials, use materials such as plants and pavers which are eco-friendly, planting over 5,000 trees over the past 50 years, and powering our office with solar energy.